Welcome to my stop on the Fins, Wings, and Other Things Blog Tour, brought to you by Peachtree Press! Be sure and check out the other stops on the tour - the complete schedule can be found on Peachtree's Blog. 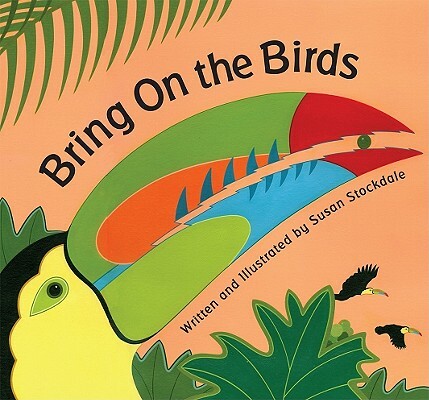 Bring On the Birds by Susan Stockdale. Ages 3-7. Peachtree Press, February 2011. Unpaged. Review copy provided by publisher. Dancing birds, diving birds, birds with fluffy crests . With catchy, rhyming text and bright, bold pictures, Susan Stockdale presents 21 different species of birds from all over the world. She really shows off all the amazing things birds can do, from dancing to swimming to hanging upside down.This is definitely a book that will inspire young naturalists and the rhythmic rhymes make for a great readaloud. Each bird is depicted realistically in acrylic paint. Ms. Stockdale includes a background for each bird, showing its natural habitat. From the great horned owl swooping across night-time farmland to the red-billed oxpecker hitching a ride across the African plains, the complete paintings give an immediate sense of location. Back matter includes additional information about each bird mentioned, including where the bird lives. 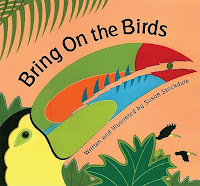 Ms. Stockdale also includes a list of some of the books she used for her research, giving kids a place to start if they're interested in further researching their favorite birds. This would make a great addition to a storytime or unit on birds or world animals. Pair it with April Pulley Sayre's Bird, Bird, Bird: A Chirping Chant. Bring On the Birds is on shelves now! And be sure to check out today's other stops: a review of A Place for Fish by Melissa Stewart over at Jenn's Bookshelf and a guest post from Melissa Stewart over at A Patchwork of Books!